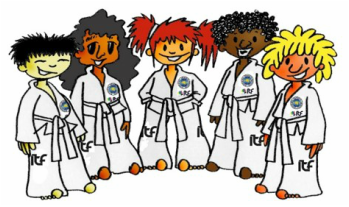 TKD Kids is our progressive life skills course for children between the ages of 3.5 and 6 years. Our specially trained instructors use this internationally successful programme to teach skills that will be useful many years after a child has left the programme. The programme is so much more that a junior martial arts class! It is designed to stimulate the child physically and mental through a variety to games and role play tasks whilst teaching the benefits of strong moral values. Our 3.5 -6 year old classes are divided into 12 week terms* which roughly track the local school terms. Each term the class will focuses on a couple of themes which the activities and games are focused around. In parallel to the theme children will develop a foundation in Taekwon-Do. This part of the programme contains the physical skills you may expect such as basic blocks and punches taught in conjunction with more general skills of balance, agility and fitness. Progression through the Taekwon-Do skills syllabus is marked by children earning their stripes which they can proudly display on their belt. In addition Taekwon-Do is used to emphasis the moral and ethical parts of the syllabus. Each student is taught about the five tenets of Taekwon-Do: Courtesy, Integrity, Perseverance, Self Control and Indomitable Spirit. Putting these characteristics into practice (including in their daily routines at home) is rewarded with the relevant tenet badge. At the end of term the children attend a 'grading' during which they have the opportunity to test their skills and knowledge. Once they have mastered all six levels they will be physically and mentally equipped to join the junior class and continue their training. For more information please contact one of our instructors. *Please note that it may be possible to start mid-term. However places are limited for these classes. It is also a requirement that children attending Kids TKD have a parent or guardian present during every class.